The accessibility and success of treatment for childlessness in Estonia are among the best in the world. Experienced senior specialists and treatment centres with the most up-to-date equipment mean that infertility treatments of the highest possible professional standards can be delivered. Gynaecologists, andrologists and embryologists working together Reproductive medicine is handled by specialists in diagnosis and treatment of infertility in both men and women, and by embryologists. 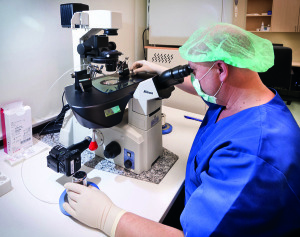 Estonia has a lot of experience of infertility treatment, and the first artificially conceived child anywhere in the Baltic region was conceived, observed and born in Estonia in 1995. Estonia’s results are among the best in the world Around 600 IVF children are born in Estonia each year, which is four percent of all births. This is one of the highest figures in Europe or the whole world, and shows how good and how accessible treatment is. A good reputation in the Nordic countries Estonian specialists are known across the region and our clinics provide infertility treatment services for large numbers of patients from the Nordic countries and ever more patients are coming to Estonia from even further away. Infertility treatment, tests and procedures, the treatment methods and the medicines used, and the legal considerations are all explained straightforwardly and in depth. Sample prices: FET: € 500 – € 600 IVF: € 1100 – € 1500 *rices are given as a guideline only. The actual price will depend on the choice of services and may vary between service providers.